Posts tagged with "iTunes Match"
Over the past couple of days, MacRumors has received several reports from users who have been able to upload music libraries of greater than 25,000 tracks to iTunes Match or Apple Music's similar scan-and-match feature, and Macworld's iTunes expert Kirk McElhearn has also noted a number of reports on his personal blog. Update 12:08 PM, December 6: Eddy Cue has confirmed to MacRumors that Apple has indeed "started rolling out support for 100k libraries." It has taken some time, and longer than expected, but those of you with iTunes Match or Apple Music and large music libraries can now upload up to 100,000 tracks to the services, up from the previous limit of 25,000. Eddy Cue, Apple's Senior Vice President of Internet Software and Services, first mentioned on Twitter in late June that Apple was working to "get to 100k [tracks] for iOS 9". Apple missed that deadline, but Cue subsequently told MacRumors that Apple was working on it and that he expected it would be released "before the end of the year" - and indeed it now has. Kirk McElhearn, experimenting with CD rips, tries to figure out what exactly iTunes Match doles out once music has been matched in the cloud. If you rip a CD, match it, then download one of the files from the cloud, you don’t ever see the Mastered for iTunes badge. I have a handful of CDs for which only Mastered for iTunes files are available from the iTunes Store (these are new releases where labels only provide files for this format). I added them to my iTunes Match account, matched them, deleted my originals, then downloaded the matched files. I compared them with my original rips (using the methods described below), and saw that these files were not the same; I was clearly getting the Mastered for iTunes files from iTunes Match. But the files don’t display the Mastered for iTunes badge. So for files that are matched, then downloaded, if there is only a Mastered for iTunes version on the iTunes store, the files you download will be in Mastered for iTunes format; yet you won’t know that. The Mastered for iTunes badge is displayed only when there is a bit of metadata in purchased files that tells iTunes to display it. 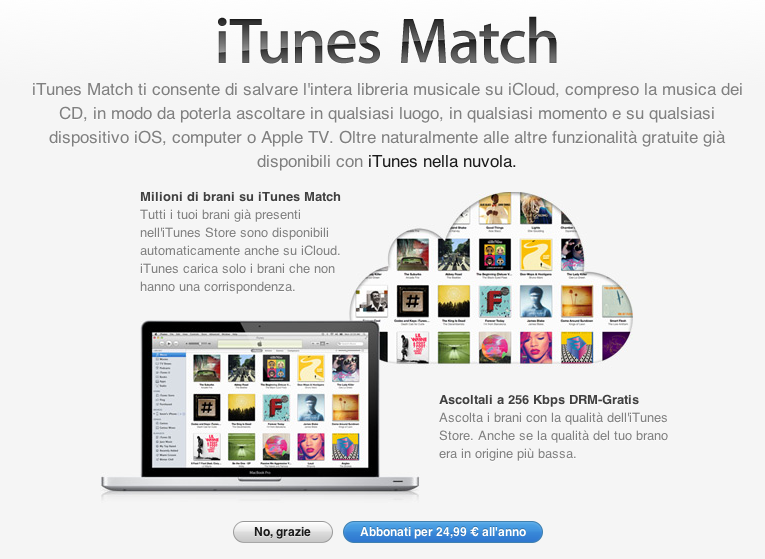 Earlier today, Apple updated its Terms and Conditions for the Italian iTunes Store to include information about iTunes Match, the company's music service powered by iCloud. Launched in November 2011 in the United States (here's our original hands-on), the service was later brought to more countries on December 15 and January 17, including South America, the UK, and other European countries. Back in March, it was reported that Apple was holding a series of meetings with SIAE -- the Italian association that represents "artists and editors" -- to get the green light on launching iTunes Match in Italy. According to Apple's official support document about iTunes Match and iTunes in the Cloud availability, Italy still isn't listed among the countries with support for Match and iTunes in the Cloud; as of today, iTunes Match is available in 37 countries worldwide. Jeff Price of TuneCore is happy and a little surprised, finding out their first royalty payments from the new iTunes Match came in at $10,000. He writes in a blog post that "this is magic money that Apple made exist out of thin air for copyright holders". The service has effectively monetized the existing behaviour of consumers, giving more money to artists and copyright holders whilst the consumer just continues to listen to their music, not doing anything "new". A person has a song on her computer hard drive. She clicks on the song and plays it. No one is getting paid. The same person pays iTunes $25 for iMatch. She now clicks on the same song and plays it through her iMatch service. Copyright holders get paid. Same action, same song, one makes money for the copyright holder, and one does not. This is found money that the copyright holders would never have gotten otherwise. It may not be a complete windfall as Jeff points out, but it has something - something that if iTunes Match didn't exist, you wouldn't get at all. Something is better than nothing. The music industry needs innovation. Services like iMatch, Spotify, Simfy, Deezer and others are bringing that innovation—it will take some time to learn which are the ones consumers want. But in the interim, seeing an additional $10,000+ appear out of the thin air for TuneCore Artists by people just listening to songs they already own is amazing! Argentina, Bolivia, Chile, Colombia, Costa Rica, Dominican Republic, Ecuador, El Salvador, Estonia, Guatemala, Honduras, Latvia, Lithuania, Netherlands, Nicaragua, Panama, Paraguay, Peru, and Venezuela. Most of these countries already had support for iTunes in the Cloud (the ability to re-download iTunes Music purchases for free), but Estonia, Latvia, Lithuania, and the Netherlands did not until today. Apple is making quick work of finalising licensing agreements for iTunes Match, the service is certainly rolling out faster internationally than some of their previous efforts. The iBookstore or even the availability of TV Shows (which is still only available in a small selection of international iTunes Stores) come to mind as examples of Apple taking a long time to seal agreements internationally. Last night, iTunes Match appeared to be rolling out early to International customers in accordance with emails Apple was sending out to users, signifying a December 14th launch. This afternoon, iTunes Match is working and available as a link in the iTunes Store from the United Kingdom, Germany, Canada, and Mexico, with more countries following. 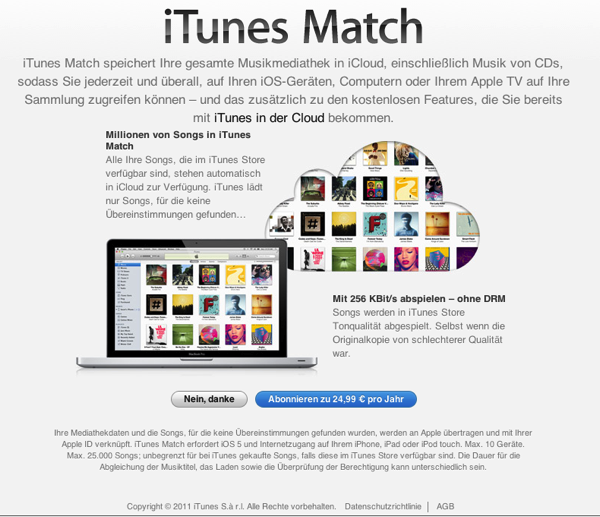 iTunes Match launched a month ago in the US, and a couple days ago in Brazil. 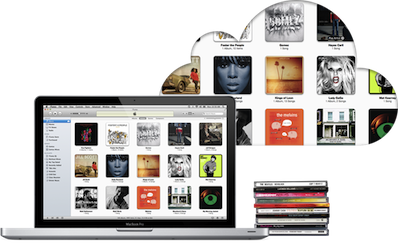 Apple's iTunes Match offers the ability to conveniently download your music library onto your mobile iOS devices and other Mac computers. Be sure to check out our hands-on with iTunes Match to learn what the fuss is about and how you can take advantage of it on everything from your iPhone to your Apple TV. This morning in Europe and Australia, Apple is rolling out iTunes Match a month after its US debut. Canadian, Australian, English, and our European friends are starting to see iTunes Match come online this evening, although customers trying to subscribe to the service early are currently getting an error as shown off by one Twitter user. 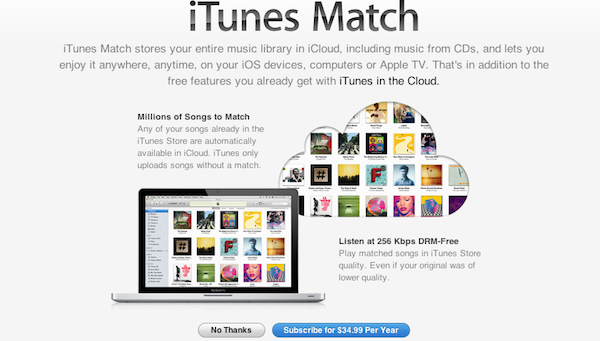 While iTunes Match is not currently being promoted in the iTunes Store, users are able to subscribe to iTunes Match through Account Management. Today's launch follows Apple's iTunes Store and iTunes Match rollout out in Brazil on December 13th. iTunes Match is an annual subscription service that matches an unlimited number of songs purchased from iTunes, and up to 25,000 of your own songs for immediate download on all of your iOS 5 devices. Songs that are scanned and not matched by iTunes are also uploaded to the cloud from your iTunes library. Apple's matched tracks are downloaded as 256 Kbps AAC files, possibly offering a free DRM-free upgrade for existing, lower bit-rate tracks in your library. For more information about how to get iTunes Match running on all of your Apple devices, be sure to check out our iTunes Match Hands On. Update: It appears Apple's international launch was premature. Apple is refunding customers who managed to subscribe in countries outside of the U.S. and Brazil, according to Darrell Etherington of GigaOM. Update 2: It's officially live! Some iTunes-compatible file formats are not allowed in iCloud at all. Digital Booklets, podcasts, bookmarks to Internet radio streams, and the like are marked Not Eligible. A few people on Twitter are reporting that low-bit-rate MP3s (perhaps below 96 kbps) are also considered ineligible for use in iCloud, though we haven’t been able to confirm that. In our overview of iTunes Match for Mac and iOS devices, Don took a look at the scanning process of iTunes libraries and the performances of iCloud music over WiFi and 3G. Understanding iCloud's status icons might come in handy if you're having initial issues with iTunes Match, which went live only a few hours ago.